Lighter, more sharp expert Long versatiles. 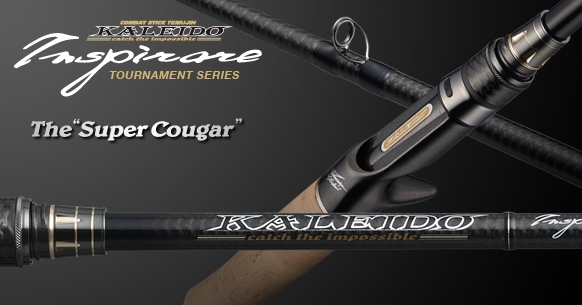 Rod that pursued the limit of high taper blanks and the latest 4 axes method to the utmost, which realized a remarkable weight saving despite having a length comparable to 7 feet, that is Spirare "Super Cougar". ± 45 ° original 4-axis cross in the part from the top to the former guide, the bat part below the former guide densely oblique reinforcement density demonstrates greater power ± 30 ° narrow angle fully armored with original 4-axis cross .Received the benefits of the latest four-axis theory and construction method, it has evolved into a further high-performance rod. Its greatest feature is to demonstrate its greatest strength when you want to quickly capture a wide area with a drastic long cast due to length.We support a wide range of swimming and moving lures such as chatter bait in Weed flat area, spinner bait, swimming jig, worm swimbait, vibration lure. In addition, by being lightweight enough to be handled with one hand, the application extends to jigs and worms and other operating lures, and it also demonstrates superb ability for spot shootwise Acura Sea Cast. Super cougar with beautiful bend curve without stagnation produced from high taper blank which adopted the latest 4-axis construction all over the body.As a long Versatile Rod, we are expanding the place of active activity more and more.